Getting healthier and getting in shape started being my focus last year and as usual, I decided to make it my resolution for 2010. So far, it's started out good and I'm sticking to it even though it's only January 10th. Last year, I lost 25 pounds and I'm still on the road of getting the rest off to ensure I'll be around a long time to see my children and grandchildren (when it's time) grow. Drinking juice is not a regular routine of mine given all the hype over unnecessary calories and high sugar content. I've heard bits and pieces on the benefit of pomegranate juice and never really thought much of it until my oldest, who works at Publix, bought a couple of pomegranates as she does like them. She also told me how many people buy Pom Wonderful Pomegranate Juice. When Pom Wonderful offered the chance to review their 100% pure pomegranate juice, I definitely wanted to try it. Pom Wonderful contains no added sugars, preservatives, colors or other filler juices. This fact is very important to me as I'm trying to eliminate refined sugards, preservatives and articifial coloring from our diets. I've been reading too much literature on the pitfalls of those products. Having the choice to drink a juice that truly is good for me and is not overshadowed by cosmetic ingredients is crucial. Another factor that draws me to Pom Wonderful is the they grow and hand pick their own pomegranates. They also squeeze it by their own proprietary presses and manufacture it themselves. Independent lab results revealed other pomegranate juices imported contained added sugars, colorants and other low grade juice filler in spite of label claims of being 100% pomegranate juice. I had no idea that there are a variety of pomegranate varieties but with Pom Wonderful, they make their pomegranate juice out of a variety of pomegranates that offers a combination of antioxidants, a deep crimson color and delicious taste. I wasn't sure I would like it and feared an after taste but much to my surprise, it tasted sweet, had a pleasant taste initially and afterwards. The complimentary Pom Wonderful arrived cold which is how you should store it after it has been purchased. I couldn't get my six year old to try it as she is not into trying new things due to being a kid and her hypersensitivity. My oldest also enjoyed the taste, the smell and agreed that there was no after taste. It reminded me a little of cranberry juice but was smoother and tasted much better. Pom Wonderful products are backed by $32 million in medical research that were primarily conducted in areas of prostate, cardiovascular and erectile function. There have been published clinical trials documenting the health benefits of consuming eight ounces of Pom Wonderful 100% Pomegranate Juice daily. Pom Wonderful is the only brand guaranteed to contain 100% authentic pomegranate juice. Pomegranates are one of mankind's earliest cultivated fruits. The pomegranate has been revered as a symbol of health, fertility and rebirth. To read more about the clinical benefits of pomegranates, go to http://www.pomwonderful.com/. Overall, I would highly recommend Pom Wonderful 100% Pomegranate Juice due to the documented health claims. To be able to not only note the clinical trials that backs the claims but to actually read them, is critical to me when laying my trust in a product. 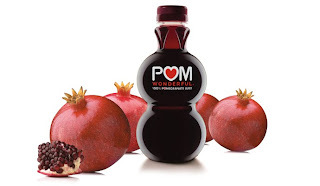 Pom Wonderful 100% Pomegranate Juice tastes great, smells delicious and has no after taste. POM Cream Cheese Frosting: Prepare fresh pomegranate juice*, score 1-2 fresh pomegranates and place in a bowl of water, break open the pomegranates under water to free the arils (seed sacs), the arils will sink to the bottom of the bowl and the membrane will float to the top, sieve and put the arils in a separate bowl. Reserve 1 cup of the arils from fruit and set aside, (refrigerate or freeze remaining arils for another use), reduce the pomegranate juice, over low heat, down to 3 fl. oz., Allow to cool, place butter into electric mixer bowl with paddle attachment and cream on medium-high speed for 1 minute, add the cream cheese and continue to mix for 2 more minutes, turn the speed down to low and slowly add in the powdered sugar and the pomegranate juice reduction, mix until the sugar is fully combined, remove icing from the mixer and place into a piping bag with a round or star tip. 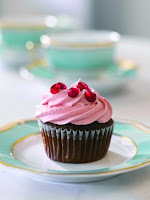 POM Velvet Cupcakes: Preheat oven to 350F, reduce the pomegranate juice, over low heat, down to 1/2 cup, place sugar and soft butter in the bowl of an electric mixer with the paddle attachment, cream on medium-high speed, until the mixture is pale yellow and fluffy, turn the speed down to low and add the eggs in one at a time, in a separate bowl, combine the buttermilk, pomegranate juice reduction, white vinegar and vanilla extract, and then slowly add half of this to the mixer, combine the flour, cocoa powder, baking soda and salt, and then sift at least two times until well mixed, add half of this to the mixer, add the remaining half of the liquids to the mixer, and then the remaining dry ingredients, finish off with the heavy cream, beat just until combined, place cupcake liners into cupcake pan, and using a spoon, fill with cake batter until it is just about 3/4 full, bake for 20 to 25 minutes, or until a toothpick inserted in the middle comes out clean, allow the pan to cool slightly, and then remove cupcakes to a wire rack to cool fully, once the cupcakes are cooled completely, they can be iced with the pomegranate cream cheese frosting and topped with fresh pomegranate arils. Nutrients per Serving (1 cupcake without frosting): 161 calories (75 calories from fat), 2g protein, 9g total fat (6g saturated), 20g carbohydrates, <1g dietary fiber, 40mg cholesterol, 13g total sugars, 5mcg vitamin A RE, 157mg sodium, 15mg potassium, <1mg vitamin C.
Nutrients per Serving (1 cupcake with frosting): 240 calories (109 calories from fat), 3g protein, 13g total fat (8g saturated), 31g carbohydrates, <1g dietary fiber, 51mg cholesterol, 23g total sugars, 23mcg vitamin A RE, 175mg sodium, 37mg potassium, 1mg vitamin C.
* For 4 cups of juice, cut 8-12 large POM Wonderful Pomegranates in half and juice them with a citrus reamer or juicer. Pour the mixture through a cheesecloth-lined strainer or sieve. Set the juice aside. * Disclaimer: I received complimentary Pom Wonderful 100% Pomegranate Juice for this review. I received no financial compensation.